Is Sam Horowitz' Bar Mitzvah Dance Video Kosher? Sam Horowitz performed a dance at the Omni Hotel in Dallas to celebrate his bar mitzvah. Sam danced on stage in November 2012 with eight (visibly taller) women dancers in a number that lasted less than three minutes where he appears on stage about halfway through. As of 8/18/2013 the video has received 726,000 views on YouTube. I think that yes, the video is kosher and an appropriate way to mark the coming of age of a young man. It is a cute and sweet and entirely wholesome performance. I assume that Sam likes to dance. He does it well. And now that he is 13 he chose to descend to the stage to enter and dance with the women in an innocent and shy way. Some rabbis disapprove of the ostentatiousness, the cost and what they perceive of as the inappropriateness of the event. David Wolpe wrote (ranted) in the Washington Post, "The egregious, licentious and thoroughly awful video that is circulating ‘celebrating’ a Bar Mitzvah contains so much that is offensive that it requires restraint to hold oneself to three ways in which this display slaughters the spirit..." I guess I saw a different video - one that elevated my spirit. For the record, the bar mitzvah is a rite of passage ritual that began in medieval times and has been associated with calling a boy to receive an aliyah to the Torah at his thirteenth birthday. To the rabbis who innovated that ritual that was an appropriate way to mark the coming of age of young boy. The rite presumes that an aliyah to the Torah has positive meaning in a community and that a young boy will appreciate an aliyah as a symbolic way to mark his turning into an "adult". That may be the case. Yet, I have attended synagogues in which aliyahs are granted in a less than wholesome and equitable way to wealthy donors and to the favorites and cronies of the rabbis and gabbais. And I have seen many bar mitzvah boys endure the requirements of an aliyah performance as an anxiety ridden ordeal, rather than a pleasant ritual. In his dance, Sam looks to me happy and full of positive expression. I deem what he did to celebrate, a proper and kosher expression of his coming of age. Mazal tov Sam! Yes, corporate raider billionaire Carl Icahn is a Jew. Wikipedia says, "Icahn was raised in Far Rockaway, Queens, New York City, where he attended Far Rockaway High School. His family was Jewish in name, but his father was a 'dogmatic atheist'. His father was a frustrated opera singer who settled on being a cantor, before becoming a substitute teacher. His mother also worked as a schoolteacher. He graduated from Princeton University with a Bachelor of Arts degree in philosophy in 1957 and then joined New York University School of Medicine, but he dropped out after two years to join the army." Icahn's net worth (3/2013) is $20 billion. He tweeted on August 13, 2013 that he had taken a stake in Apple stock and the buying that ensued sent the stock up over 5% within a day. Is Steve Lonegan, the anti-Spanish former Mayor of Bogota, Jewish? 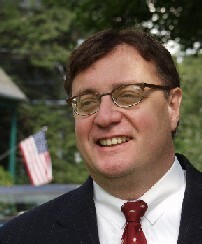 No, New Jersey Republican gubernatorial candidate Steve Lonegan is not a Jew. He is Catholic and attends St. Joseph's Roman Catholic Church in Bogota. Don't confuse this town with the capital city of the same name in Colombia, South America, where the official language is Spanish and the national motto is Libertad y Orden. The Bogota NJ city council made it perfectly clear last week that is wants no Spanish billboards in that borough. Apparently NOBODY told these folks how dumb they look protesting a billboard. So they escalated the matter by protesting to the offending advertiser, McDonalds, and by calling for a boycott. Thankfully. McD's won't budge. They are removing all doubt down there south of Teaneck. Even NPR is mocking them. Anti-hate web sites feature Bogota's Mayor as a poster boy for racism. Yesterday morning on FOX and Friends First, Steve Lonegan, Mayor of Bogota (pronounced Bug-OH-dah), New Jersey, proved that bigotry, pettiness, mean-spiritedness and prejudice are alive and well on FOX News Channel and, sadly, it seems, also in New Jersey. Mayor Lonegan is very, very, very upset that McDonalds has posted a Spanish-language billboard in his fair city of 8,000 (1,680 of whom are Hispanic) and is agitating to get them taken down. I don't know why Mr. Lonegan did not try to rename his borough. After all Bogota looks a lot like, Bogotá, the capital city of the Spanish speaking South American country Columbia. Wikipedia reports that, "Bogotá is the largest city in Colombia, and one of the biggest in Latin America." Bogota is a Borough in Bergen County, New Jersey, United States. As of the United States 2000 Census, the borough population was 8,249. Bogota was formed on November 14, 1894 from portions of Ridgefield Township at the height of the "Boroughitis" phenomenon. Portions of Bogota were taken in 1895 to form part of the new Township of Teaneck. Bogota was named in honor of the Bogert family, which had been the first to occupy the area. The Mayor of the Borough of Bogota is Steve Lonegan. Members of the Bogota Borough Council are Pat Kearns, Joe Noto, George T. Shalhoub, Melissa Schnipp, George Silos and Patrick McHale. In July 2006, the conservative Mayor Lonegan, who in previous years had unsuccessfully sought several higher offices, including a race for governor in 2005, created a firestorm when he engineered a Borough Council resolution requesting that McDonald's remove a Spanish-language billboard for iced coffee in town. Lonegan said the billboard was 'divisive.' The story received national publicity, occurring concurrently with a national debate on illegal immigration. My teacher, Rav Soloveitchik taught that the selichot prayers are an outcry to God, a form of prayer that is out loud and hence a blatant public event. Outcry prayers he says, are different from more ordinary request prayers, more dramatic and more emotional. The obvious repetition in those liturgies makes sense to the Rav because outbursts expressing needs and drama and emotion are repeated. I disagree. Outcries ordinarily are one-time events. Only in utter desperation are they repeated. We who recite this prayer are not in utter desperation. The repetitions of Selichot are way too numerous to make sense to me as outcries. And the label of "outcry" or "outburst" is hardly a category bearing significant cognitive meaning, deep theological content or any distinctive personality. So no, it is not correct to read the selichot as outcries. What then are the selichot? Selichot are quiet and personal and above all, meditations seeking compassion. Repetition is a hallmark of meditation. And compassion is a central end goal of the High Holiday season, central in particular to the Yom Kippur liturgy. In his wonderful book, "Before Hashem You Shall Be Purified : Rabbi Joseph B. Soloveitchik on the Days of Awe," by Joseph B. Soloveitchik and Arnold Lustiger, Lustiger says, "On Rosh Hashanh, Hashem moves from the throne of justice to the throne of mercy (p. 35)." Call it mercy or or call it compassion, I agree that movement takes place in the prayers for these holidays. Through this season our prayers call on us to alternate between a definite certainty of the Kingship of God and a great uncertainty of the worthiness of our actions. We vacillate, we move at times into the personality of the brave public celebrity who is sure that we are number one and our God is number one. Then we move into the personality of the insecure meditator, who seeks through meditative introspection a confirmation of the worthiness of his meager life. In one part of our service we crown God our King. And in another we meditate and seek the king's compassion so that we may live another day. We start out this dramatic up and down High Holiday season as meditators seeking the compassion of God in the repetitions of the selichot prayers. Next we will go on to proclaim the Kingship of God on Rosh Hashanah. Then on Yom Kippur we will return and focus on our complicated quest for compassion with many quiet and personal selichot meditations -- persistently seeking compassion. 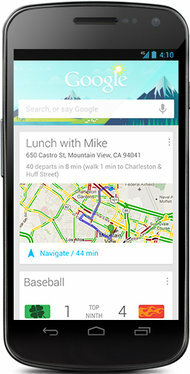 Is Google NOW incredible or creepy? Is NOW kosher? There sometimes is a fine line between incredible and creepy.The Times hints at this in a review of phone app technology that seems to know what you are thinking, especially Google NOW. Case in point. Yesterday I had to go from Teaneck, NJ to Forest Hills Queens, NY to attend the funeral for my sister's father-in-law. Knowing the possible traffic situations I figured on leaving my house an hour earlier, at Noon. I actually left about 12:15. The event time and location were in my Google Calendar. And so, I was on the GWB I got an alert from Google NOW at about 12:30 - telling me I had better leave now to get to the funeral on time. First I thought, this is incredible. Then I thought, this is creepy. Finally I thought, NOW is not a New Yorker and does not have a clue about the time you need for getting around the city, especially for potential parking time. Already, an app called Google Now is an important part of Google’s Internet-connected glasses. As a Glass wearer walks through the airport, her hands full of luggage, it could show her an alert that her flight is delayed. The Times mentions some of the other amazing feats that NOW can offer - once you give up your privacy entirely to Google. I have it on my phone and I've been kept apprised by NOW of package deliveries, (Google's imagined) travel time to home and work and other meetings, stock prices, nearby restaurant recommendations and more. Bottom line? Let me say I certify that NOW is kosher. You will have to judge for yourself whether it is incredible or creepy. My son, his wife and children have decided to make aliyah to Israel. My husband and I understand their practical and idealistic motivations for this decision. We applaud what they are doing and feel pride in their Judaic and Zionist ardor. We plan to visit them in Israel periodically, but we have no plans to move there. At times we both admit to ourselves that we worry about them and that we will sorely miss them. What advice can you give us to help us cope with this bittersweet situation that we face? First, know that you are not alone. In our area, a good number of Modern Orthodox families with young children make aliyah. An underlying motive for this uprooting is the financial burden of local day school tuition. That concern combines with years of sincere devotion to the Zionist dream. Modern Orthodox education encourages pride in the miracle of the State of Israel. And many Jews simply feel a mystical attachment to the Land of Israel.